He sees you when you're sleeping. He knows when you're awake. This year, jolly old St. Nick knows Bernie has been sleeping on preparations for a special Christmas celebration with his son, Charlie. Enter Plumpy Napoleon, fresh from a short stint in prison, to save Bernie from the naughty list. Plumpy calls his latest business plan "Santa 365". 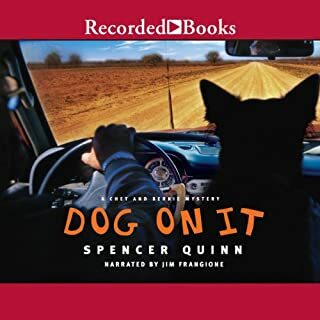 Spencer Quinn follows the critical success of his "New York Times best-selling Dog on It with this second mystery starring hapless private investigator Bernie and his four-legged partner Chet, a K-9 school dropout. While Bernie continues his struggle to pay the bills, Chet - with his sharp nose and even sharper teeth - keeps bringing down the perps. Told from Chet's perspective and featuring the humorous ramblings of a dog, Thereby Hangs a Tail is another winner. 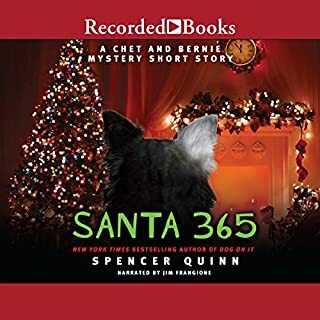 Hot dog: listen to another Chet and Bernie Mystery. 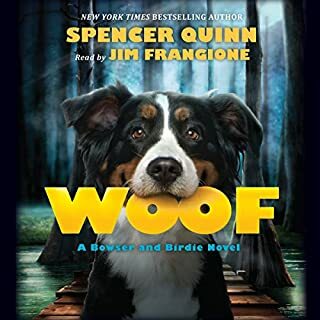 Because I'm not a dog, I can't say for sure that the author and reader of this delightful story have perfectly nailed what goes on in a dog's mind. But it sure sounds like it. The reader, Jim Frangione, is fantastic. 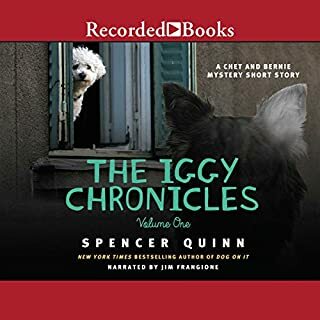 Everything about Frangione's delivery portrays Chet, the engaging animal who tells the story, just as I imagine Chet would sound to another dog. This book is the second in the series. I suggest starting with the first in the series, but it's not impertive to do so. The second book is even funnier than the first. I hope this series continues for many dog years to come. Having thoroughly enjoyed the first Chet & Bernie mystery, I was delighted to find the second, and I was not disappointed. Again, the character of Chet comes through and rings true -- dog lovers will recognize the mannerisms and behaviors in their own dogs. And even if he tends to repeat himself or wonder off into wild tangents, well, dogs do that! The mystery was a bit better this time, too. 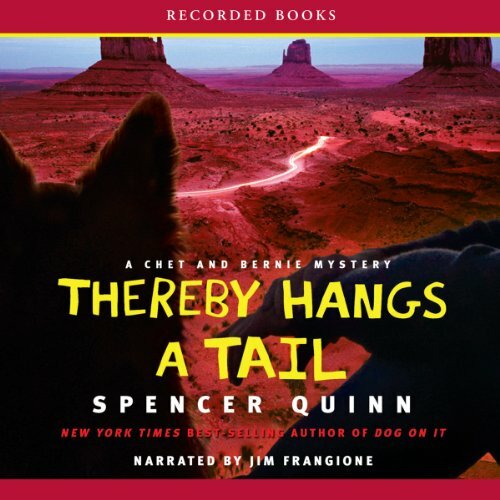 My son is not a big reader, but on a recent trip I coaxed him into listening to Thereby Hangs a Tail. Later I listened as he told his girlfriend about it. He as animated and enthusiastic about Chet and the story. As he told her, Chet is the best. Spencer Quinn has done a masterful job of telling this story from Chet's point of view. The mystery is better than in Dog On It. I can't wait until the next one comes out. I am a Chet and Bernie fan, and so is my son. Enjoyable through and through--a tale well told. The narrator is so convincing that I began to think he really was Chet! At a time in my life as a Mother with grown children facing life's challenges - while having an weekend without grandkids to keep me busy - these 2 books kept me wrapped in a world that was easy to feel every moment. All I want is another book to know what these 2 are doing next! I love this series. I'd like to think my dogs are as smart as Chet. Lots of fun! 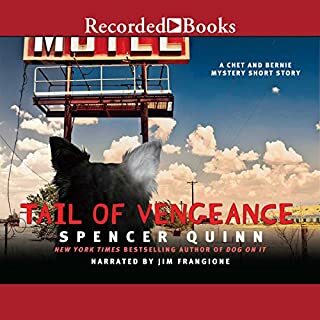 Another winner by Spencer Quinn. 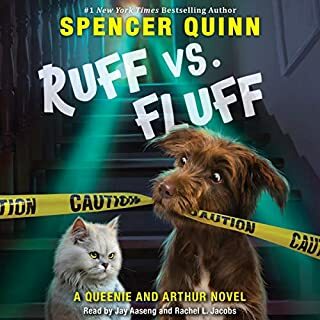 I haven't totally finished the book since I had some problems with my CD player but I just love the characters and humor. I have several dogs and gosh , if they could write a story THIS is how it would be told. I totally adore Spencer Quinn and the characters he creates. Even the side characters are fun and interesting! Funny and original@ Love it! The second book picked right up from the first, with Chet personal twist on things. I have immensely enjoyed these books and the narrator is in my top 4 list! Wonderful listen, well worth buying! Chet may not yet be a better narrator than Sneaky Pie but I like his stories better. I love the way his thoughts track - or don't - The story is a good read and like the first one, this is a book that I will listen to more than once.